This is a new arrival 3D VR Headset with a Remote Controller, which supports many Smartphone models with Android and iOS system. 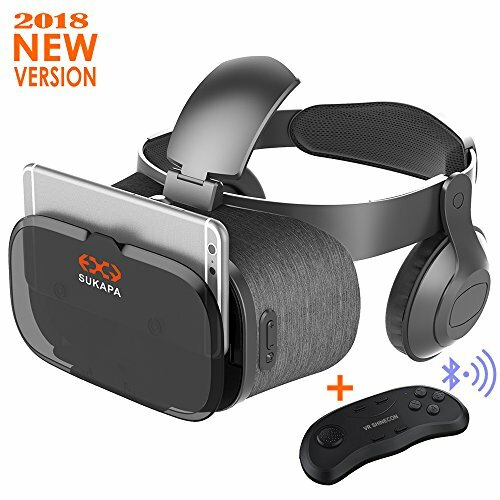 Put your phone into this VR , you can enjoy the super big screen effect 3D videos, no need to go to cinema; you can also play 3D games with it, which enables great immersion experience. You can experience the immersive, fun, exciting world of VR and enjoy 360 degree panoramic videos and photos. The latest version of VR in 2018 - After months of research, development and adjustment, we have developed a smaller volume and weight of VR headset, we also attach great importance to the internal components, through the 81 processes, 60 components are accurately assembled . Sukapa Oasis VR with a new handheld controller that seamlessly responds to organic, human movements in virtual reality experiences. We use a wide-angle lens of 112°, the widest angle of view of existing products, aspheric optical lens also eliminates optical aberrations, while multi-layer blue film provides eye protection by filtering out harmful rays, and is unmatched by wearing Sukapa Oasis VR Viewing experience. Sukapa Oasis VR is a VR product that comes with high-fidelity stereo headphones. Its built-in noise reduction high-fidelity stereo headphones provide first-rate audio output. It also has buttons for volume control and answering calls. Compared with elastic strap, retractable straps are used to make it easier to adjust the elasticity. Meanwhile a comfortable foam pad is provided to ease head fatigue. The top cover adopts a humanized design to prevent the headset from sliding down, so that the force on the head is more balanced. Both children and adults can wear it, and it is widely adapted to different head forms. The surface of the product adopts the fabric technology, making the product more lighter and more ventilated. If you have any questions about this product by Sukapa, contact us by completing and submitting the form below. If you are looking for a specif part number, please include it with your message.